Leslea Newman and Peter Ferguson, Berkeley: Tricycle Press, ISBN-13. 978-1-58246-224-0, 2004, 30pp. 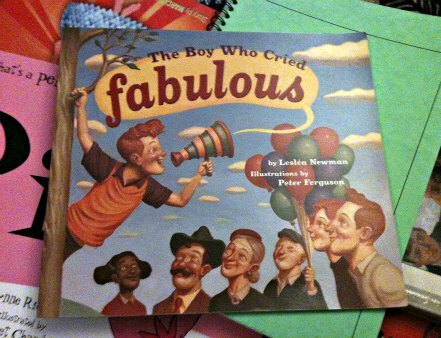 How could I not pick up a book called The Boy Who Cried Fabulous and not buy it right then and there?! While I had read other picture books by Leslea Newman before, I had not heard of this picture book until a serendipitous trip to the book store one day. After that, my life has been fabulously changed! Told in rhyming couplets, the picture book follows a boy called Roger as he gets distracted on his way to and from school. Everything around him grabs his attention in the most fabulous of ways! Whether it is a window display, a freshly baked pie, a horse and carriage or the night sky, Roger notices it. His wanderings also mean that he is usually late, despite warnings from parents and teachers, getting him into trouble… until he figures out a way to express his delight in the world in many different, marvellous, splendid, magical ways! The picture book is set in a 1950s Americana city landscape and I can’t help but fall in love with dapper Roger. I would also be lying if his character didn’t play off some gay male stereotypes: from the choice of ‘fabulous’ as Roger’s favourite word to his initial fascination with clothes and accessories. While I find enjoyment in the playful subversiveness of Roger’s character in a picture book, the overall message is that even if your viewpoint may be misunderstood at first, it doesn’t mean you’re not fabulous! **Apologies for the tardiness of this post. Thursday was US Thanksgiving, and this ex-pat was feasting on devilled eggs and pumpkin pie! Sigh…If only I were still a Librarian, I’d buy it for my school libraries. Still at Librarian AT HEART. Totally still a librarian at heart, Cindy!